Warren Buffett married his longtime companion, Astrid Menks, in a private ceremony Wednesday, the Omaha World-Herald reported in a copyrighted story in its Thursday editions. Buffett's daughter, Susan, hosted the wedding at her Omaha home. She said her father and Menks, 60, were married by Douglas County District Judge Patricia Lamberty in a 15-minute ceremony on Buffett's 76th birthday. "It's her only and his last (wedding)," Susan Buffett said her father said. 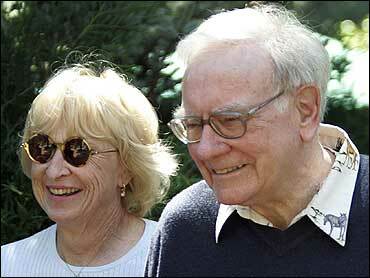 Buffett's first wife, Susan, died July 29, 2004, at age 72. She moved to San Francisco in 1977, but the two remained married and were together often and talked frequently when apart. The Berkshire Hathaway chairman and CEO announced in June that he would bequeath the bulk of his roughly $44 billion fortune to the Bill and Melinda Gates Foundation. He donated the first 500,000 shares of Class B stock last week.